You might not have noticed but the Facebook messenger app split has already started. However, the change is not yet affecting all of Facebook’s mobile users. It will only affect users of the iPhone and Android app; messages will remain in the iPad and Windows Phone app. Although it is yet not clear how long it will take for all of Messenger’s holdouts to see the change, but according to the Facebook’s the spokesperson it will continue to roll out over the coming weeks. 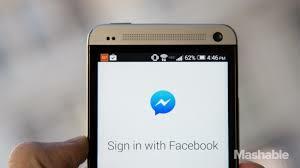 Facebook app has been prompting users to download Messenger since April, when the company announced it would be making the switch, but, users could still access messages without downloading Messenger until now. Facebook has been slowly ramping up to this change since the spring, when Facebook first announced it would be requiring mobile users to download both apps. Users have been receiving emails to their messenger hangouts alerting them their messages would be moved over to the Messenger app in the very near future. According to Facebook, Messenger will benefit all users as messaging with Messenger is faster and more reliable.